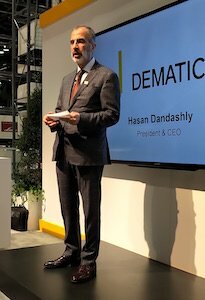 Dematic president and CEO Hasan Dandashly introduces new products at ProMat 2019. CHICAGO – As it celebrates 200 years in business, Dematic introduced new intralogistics solutions for omni-channel retailers, wholesalers, grocers and B2B distributors on the show floor Monday. Capitalizing on the micro-fulfillment trend, Dematic is offering a rapid response e-commerce order assembly system designed to support home delivery, as well as click & collect. Micro-fulfillment systems are usually inside a retail store or in an urban distribution centre. They typically use part of an existing real estate footprint to allow e-commerce fulfillment and in-store shopping under the same roof, but without getting in each other’s way. 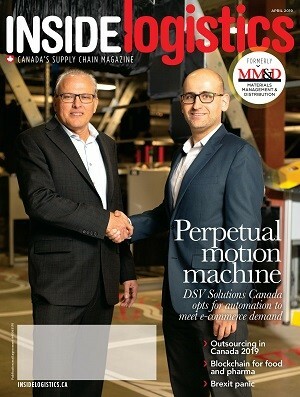 Dematic president and CEO Hassan Dandashly said the trend if driven by labour shortages, high real estate prices and the continual pressure to increase e-commerce order fulfillment speed. “The solution is a powerful process improvement for businesses that are looking to optimize their omni-channel distribution strategy by more effectively using existing retail stores or urban service centres for e-com order assembly,” said Dandashly. The system is configurable to accommodate the SKU capacity and order volume required. Micro-fulfillment works for grocery, auto parts, consumer electronics, sporting goods, apparel, industrial supplies and department stores that are re-purposing retail store space. The solution is high density, fits into a compact footprint and has options for temperature-controlled storage and food safety. Dematic MicroFulfillment is scalable, so it can be expanded or re-configured for future change. The order management and execution software coordinates labour, inventory and robotic shuttles to assemble orders with accuracy and speed. The entire process is optimized from inbound receiving and put-away, to order picking and consolidation.